The 2015 NFL Draft was nothing if not the official beginning of phase two of the debate between choosing Jameis Winston or Marcus Mariota, a flurry of discussion that really started to take off last January, when the two Heisman Trophy winners met in the Rose Bowl. For this head-to-head match-up, Mariota came away with a decisive victory, sparking his Mighty Ducks to a 59-20 blowout over the Seminoles. The professional game, of course, is a far different beast from the NCAA. With the smoke clearing, Winston and Mariota had gone one and two in the draft – to the Tampa Bay Buccaneers and Tennessee Titans, respectively. Going forward, however, the Winston versus Mariota debate may quickly degenerate into a one-sided affair, more akin to Andrew Luck vs. Robert Griffin III or Peyton Manning vs. Ryan Leaf than any sort of close comparison. All things considered, we’re fairly certain that Jameis Winston is set for a more productive career than Marcus Mariota. Of course, it’s entirely possible that things don’t wind up going as planned (no one gets drafted top two in the NFL because they’re expected to be a bust), but it’s important to note that there are three factors that give Winston the edge over his inevitable counterpart. There are some who have already downgraded and written off the polarizing Jameis Winston for his apparent character flaws. These off-the-field issues stem from incidents including jumping on a table at the student union to scream obscenities as well as allegations of sexual assault and the theft of crab legs. On the field, an openly petulant Winston was known to engage in brazen shouting matches with head coach Jimbo Fisher. Last September, an exasperated Fisher ordered Jameis Winston back to the locker room, after the quarterback began warming up for Clemson in full pads, despite being suspended for the game. Winston and his bizarre antics have stood in sharp contrast to Marcus Mariota, who has been described as a model citizen. NFL teams, of course, have always railed against any unnecessary distractions out of the quarterback and face of the franchise. Against this backdrop, Jameis Winston has unfairly been dismissed as a JaMarcus Russell clone. Russell, of course, was the first overall pick in the 2007 NFL Draft, but was out of football within three short years, after various embarrassing battles with his own weight and run-ins with the law. For many reasons, Jameis Winston is more so comparable to Ben Roethlisberger, than he is to JaMarcus Russell. For his part, Roethlisberger went 13-0 as a rookie starter, before wining two Super Bowls, by the age of 26. Roethlisberger also dealt with a motorcycle accident, weight concerns, and sexual assault allegations throughout his early years as a professional. Still, Big Ben has managed to thrive within the Pittsburgh system. Winston is also likely to succeed beneath the regimented world of the NFL. At this level, almost every minute will be accounted for, in terms of practice, workouts, camps, and watching film. On the field, Jameis Winston will have a pair of two 1,000-yard veteran wide receivers at his disposal in Vincent Jackson and Mike Evans, as playmakers and mentors. 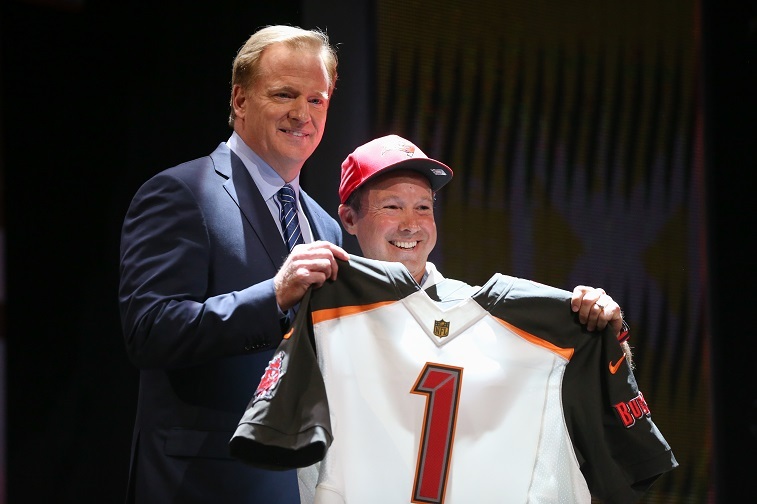 Expect Winston to embrace the demands of NFL professionalism – and to start by opening day. 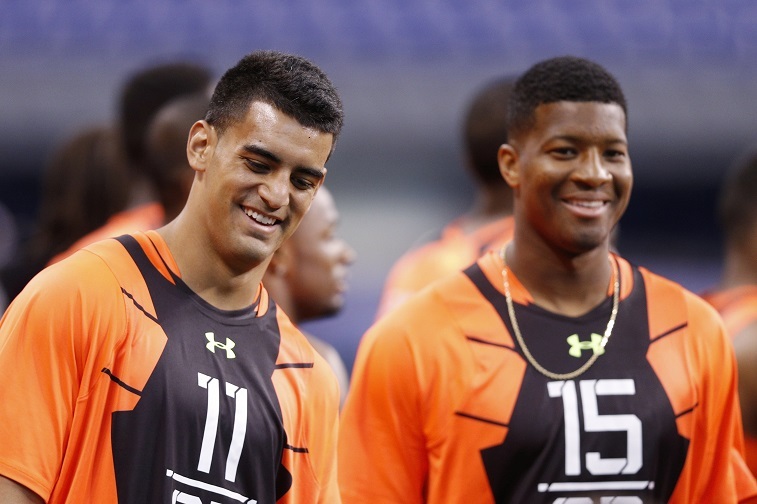 Side-by-side comparisons between Jameis Winston and Marcus Mariota do offer up great contrasts in playing styles. Winston is a statueseque pocket passer, while Mariota may be best described as a dual-threat quarterback. To date, the jury is still out, as to whether a mobile quarterback can succeed in the NFL at an elite level. At worst, a mobile quarterback will ignore open receivers, panic, and be dropped for huge losses behind the line of scrimmage. At his best, a scrambling quarterback would still expose his body to injury, out in the open field. In the NFL, Marcus Mariota has the potential of being exposed as little more than a system quarterback at Oregon. In college, Mariota ran the read option, which literally had him playing pitch-and-catch with a designated receiver. When the defense took away this first option, Marcus Mariota, who was clocked at 4.48 in the 40-yard dash, would simply take off and run for big yardage. As a professional, however, Mariota will not enjoy the luxury of either throwing into enormous windows or outrunning NFL defenses. For now, it would actually be ideal for Mariota to sit for at least one year behind a poised veteran quarterback to learn the ins and outs of running an NFL offense. Titan incumbent quarterback Zach Mettenberger, however, is only 23, and is decidedly not the kind of figure we mean. Certainly, pressure will mount to throw Mariota into the fray and trial by fire. A few rough outings however, could destroy Mariota’s confidence, if not force the rookie quarterback out of the game and onto injured reserve. In contrast, Winston was the best pure passer in the draft, by far: already capable of making NFL-caliber throws, which would include leading crossing receivers across the middle in traffic and firing deep outs towards the sidelines. At a stout 6-foot-4, Jameis Winston will stand tall in the pocket to go through his third and fourth progressions, before delivering a strike to the open target.Unlike his fellow quarterback, Winston is ready to start right now and manage a limited playbook at the NFL level. Many NFL analysts and scouts seemed to have discounted the importance of charisma in terms of evaluating Jameis Winston against Marcus Mariota. Mariota, both in interviews and on the field, often comes off as scripted, if not robotic. Ironically, it has been Winston who is most notable for his affable demeanor and megawatt smile that can light up any room. 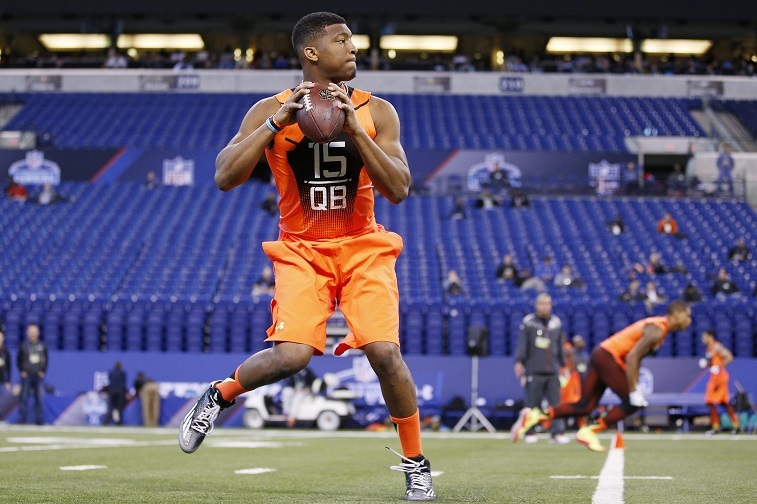 Jameis Winston’s Jekyll and Hyde persona will win ball games and bring attention to Tampa Bay. While we’re certain that the NFL would prefer every athlete was more of a Mariota — little more than a walking advertisement for the league and it’s sponsors — we’re equally sure that Winston possesses many of those “intangibles” that people salivate over when discussing NFL prospects. At Florida State, Jameis Winston went 26-1 and won one BCS National Championship, as a two-year starter. For the 2014 National Championship, Winston marched the Seminoles 80 yards down the field in less than one minute for the winning touchdown, as a redshirt freshman. 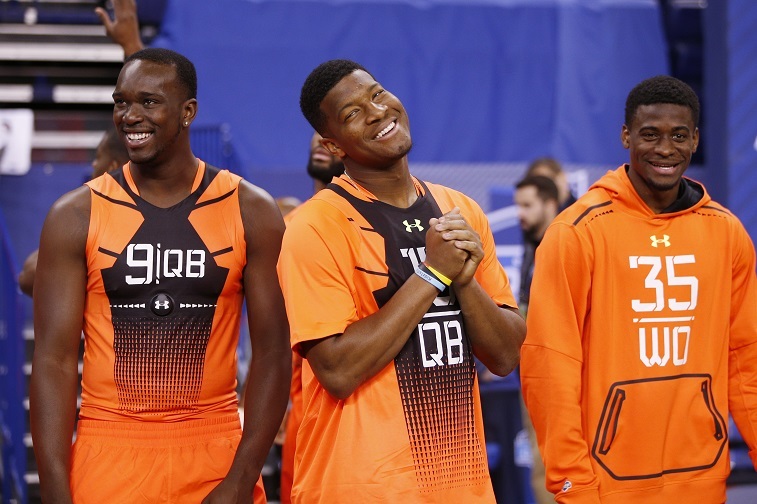 Jameis Winston, as a charismatic leader, is already poised for prime time.